If you get a free moment — make that a good 30 minutes — to comb YouTube for vintage Bob Marley interviews, you’re likely to see a guy who is fairly pleasant, soft-spoken and most definitely unapologetic. You’ll also see that Marley wasn’t fond of doing interviews. Friends close to the man who earned the nickname “Tuff Gong” as a rude-boy teenager growing up in Kingston, Jamaica’s Trench Town, will tell you he had no ego — and hated talking about himself. You can tell that Skip Marley, the legend’s grandson — whose mother is Cedella, Bob’s oldest daughter with his wife, Rita — has studied his grandfather in every way. Only 20 years old and green in the music game, Skip Marley’s answer to the question about his musical style, reminiscent of Bob Marley, couldn’t have been better. Based on that answer alone, the kid has a bright future. Born in Kingston, Jamaica, and raised in Miami, the music bug bit Skip Marley early — and he bit back, teaching himself to play the piano, drums, guitar and bass. In 2015 he released his first single, “Cry to Me,” and a second single called “Life” under the Tuff Gong label, showing off a smooth and raspy sound that’s oh-so-undeniably Marley. He later signed with Blue Mountain Music and joined his much-more-famous uncles Damian and Stephen on their Catch a Fire tour. In a family blessed with abundant talent, Marley said he feels no pressure to outdo anyone — even as journalists pepper him with the “carrying on his grandfather’s legacy” question ad nauseam. Already known in Jamaica, Marley hit the national scene earlier this year when he performed at the 59th Grammy Awards, singing “Chained to the Rhythm,” a song he co-wrote with Katy Perry. 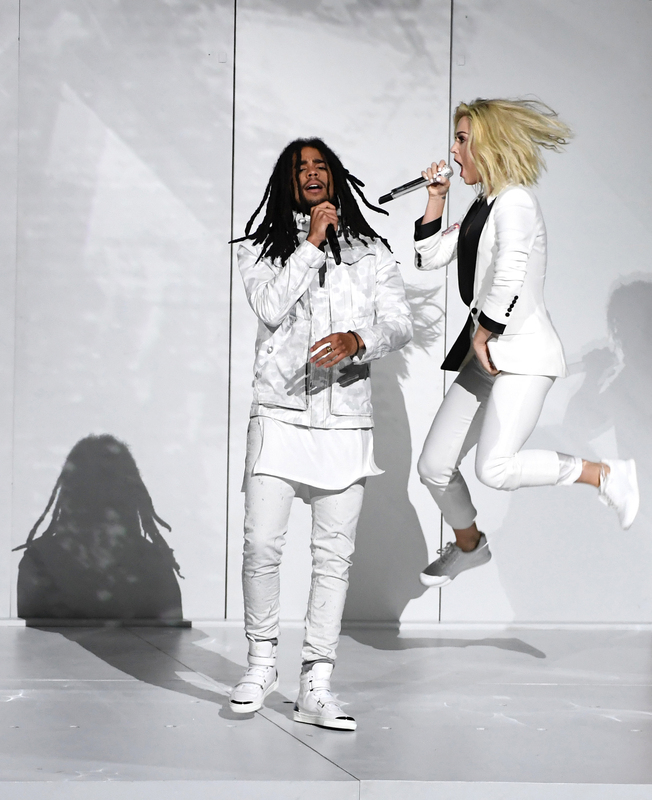 Recording artists Skip Marley (L) and Katy Perry perform onstage during The 59th GRAMMY Awards at STAPLES Center on February 12, 2017 in Los Angeles, California. Of his genre, Marley hesitated to put himself in a box. Marley said his summer will likely include a tour and other to-be-named collaborations. But his immediate plans include prepping for the inaugural Kaya Fest, a show on April 22 in Miami whose lineup is a who’s who of Marleys — including Stephen, Ziggy, Damian and Ky-Mani — and other familiar names on the reggae scene, including Sean Paul and Inner Circle. Understanding his own role in that family dynamic, Marley mentions his biggest support, his mother, revealing that the first song he ever wrote had to have her blessing. “Definitely … she’s been backing me 220 percent, you know?” Marley said of Cedella Marley, whose own musical career goes back to the ’80s, when she was a staple in the family group Ziggy Marley and the Melody Makers, headlined by her brother. Asked what he might ask his famous grandfather if he had the opportunity, Marley’s answer was as thoughtful as the legend might’ve been.